Loving Sai Ram and greetings from Prasanthi Nilayam. Dear reader, wherever you are, I do hope you had a wonderful birthday season and that the various services we offered during that period, contributed in some measure to your ananda. We too had a wonderful time. However, it was also a hectic one that sometimes drove us crazy – no surprise in that since we suddenly had to shoulder so many heavy responsibilities, all at the same time. As a matter of fact, we still have to recover from all that stress and strain, and when we do, we hope to live through the birthday memories in a slow and leisurely fashion, savouring the joy of that landmark event in full measure. The crowds have now melted away, and people have gone back with great memories. Over here, there is a lot of euphoria, particularly amongst the lucky set of people who always manage to evade work and have all the time in the world to enjoy. Then there are others who are not so happy because they could not command the influence and the authority they once used to; in other words, in the so-called influence play that is always there some have lost and are not happy about it; that’s what happens when devotion takes a backseat and worldly desire plus personal ambition dominates. Then there are the old timers who in earlier times used to receive a lot of personal attention from Swami; suddenly, they now find that access to Swami is not as automatic as it once used to be. No wonder many of them are griping and complaining that, “Swami did not even look at me once!” All that is just a sample of the birthday spectrum, shall I say? This reminds me of a birthday season about 15 or so years ago. Birthday was still about a week away but the VIPs were already here, doing their jockeying to get attention, favours, special interviews and what not. It was about 3 p.m. and Swami was expected for the afternoon darshan – yes 3 p.m., believe it or not; that was the way it used to be back then. I was in the veranda crushed between many devotees, all far more important than me. While most sat silent or reading sloka books and waiting for Bhagawan, there were a small number who were busy discussing exchange rates, dollar versus the rupee, the pound versus the rupee, how the Singapore and Hong Kong dollars were faring, and so on. Boy, was I shocked?! I am drawing particular attention to this minor incident to make a major point which is: What exactly does Swami mean to us really? Where do we as individuals, go from here? Have the two got any connection whatsoever? Is Swami’s incarnation in any way related to all this, or is His relationship with us merely a personal sideshow? In turn, these raise many other related questions, all of which need to be analysed and discussed in some depth. I am interested in all these queries because for me the big question would be: Is there any special role for Radio Sai in this post-birthday era and if so, what exactly is it? Before I get on to that, may I take a few minutes off to draw attention to a fact that might have escaped most of you? 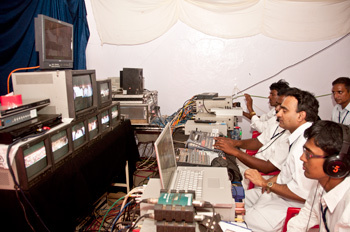 While the world was busy celebrating the 85th anniversary of the Advent of the Sri Sathya Sai Avatar, Radio Sai was quietly crossing the 10th anniversary of its birth, preparing to enter its teens! The question I posed regarding the role Radio Sai should play is therefore important in that context also, since it implies that we must shoulder a much bigger responsibility than we have done so far. Perhaps, by way of preparing us for this new and enhanced role, this Birthday we got more than a fair share of duties, shall I say? Here, for the record, is a partial list of the things we did – I am not saying all this for bragging purposes but by way of indicating how we ought to grow up and take a greater responsibility in spreading the message Swami in ways previously not considered. And since this is something in which you too have to be involved, I guess I am entitled to mention how this Birthday, we played a far more active role than ever before. 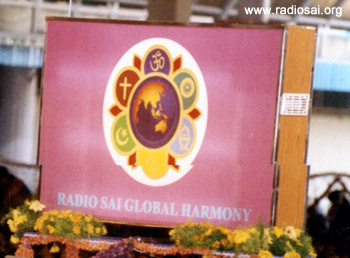 I am sure many of you at least remember that Radio Sai’s story began on the morning of 23rd November, 2001, when after Swami pressed a switch as a part of the birthday function, Radio Sai went on the air for the first time. It happened before a big birthday crowd assembled in the Sai Kulwant Hall. Few if any in that audience appreciated that history was being made, and I guess on inaugural day, maybe in all there were three or four listeners to Radio Sai including yours truly. 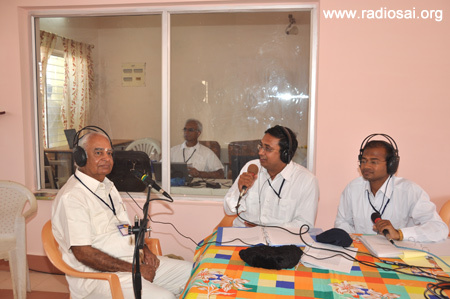 From there, we have come a long way to broadcasting live the birthday proceedings on the occasion of the 85th. 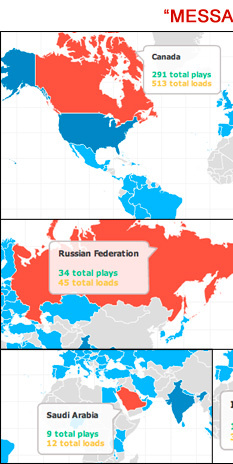 This time, we had a global audience and boy, were they thrilled. 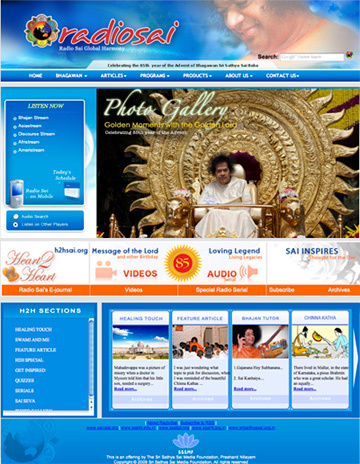 Add to that the month long tele-serial THE MESSAGE OF THE LORD, Radio Sai has well and truly become the Lord’s message carrier! 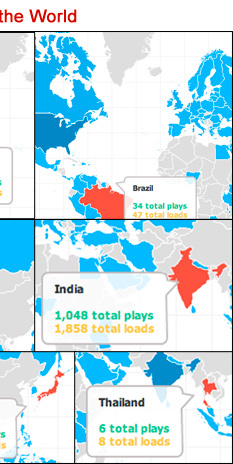 Incidentally, this tele-serial is still being viewed and has been seen in over 120 countries. In terms of numbers, viewers in America have beaten those in India by a big margin. Move over in India they seem to be saying and at this rate, I guess people here should start worrying about Swami moving His headquarters to America! 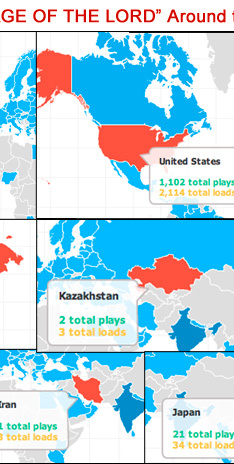 The 30-episode video serial "Message of the Lord" was watched with great interest in more than 120 countries which included little known nations like San Marino, Guam, Guadeloupe, Samoa and so on. For those of us who work in the Studio here, this is like adrenalin, but given our mandate, we really ought to be more concerned about where we go from here, in terms of objectives; and it is on that subject I would now like to make some remarks. No doubt we have a big wish list from fans and avid listeners, but most of them would like the standard anecdotal kind of programs featuring recalls, miracles and that kind of thing. 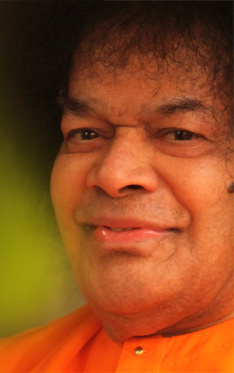 While that might appeal to a certain section of the listener base, we are expected to keep in mind that we are meant to take the message to as many people as possible the world over, suitably transcending barriers of race, religion, culture etc., focussing at the same time on the core aspects of Swami’s teachings. 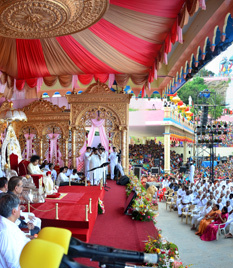 What I am driving at is that from now on, we would like to focus heavily on how Bhagawan’s message is relevant to all aspects of life, from the micro to the macro. In a sense, we have been doing the same even earlier, but from now on, this aspect would receive greater emphasis and in many different ways too. 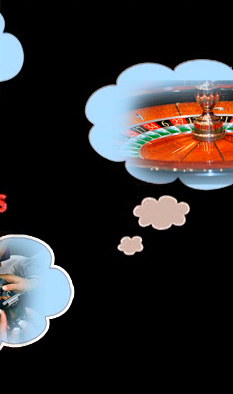 So much for the new and improved approach [as they say in all promos] about our thoughts for the future. Let me now amplify all this a bit more. Few realise that historically, spirituality came before religion. This happened because in the beginning people wondered mostly about what surrounded them, where it all came from and what was their relationship to Nature? That was when ideas first began to emerge about super natural beings, something above and beyond us, etc. In due course when associations commenced largely for reasons of labour-sharing and collective security, the idea of a common code began to emerge. Inevitably, this was tied to aspects of the local belief systems and that is how religion slowly began to take shape; as I see it, religion often evolved as applied spirituality; at least, in India that was the case, as is evident when one compares abstract Vedanta with Vedic rituals. 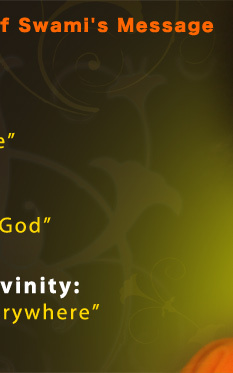 In Hinduism as it is often called, there was always a lot of stress on the personal God and individual liberation. By the way, scholars would point out that there is really no such thing as Hinduism, this being a word invented by Westerners. What others refer to as Hinduism was always known in India as Sanathana Dharma, the stress being on the fact that this code was based on Dharma and thus eternal, since Sathya and Dharma transcend Creation. 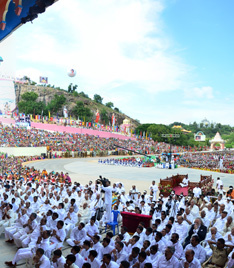 Swami pitches His teachings at the Universal level, since He wants to bring the whole of humanity together; that is why He gives a lot of importance to Sarva Dharma concepts. In fact when a VIP comes here, you would hear quite a few Sarva Dharma bhajans. 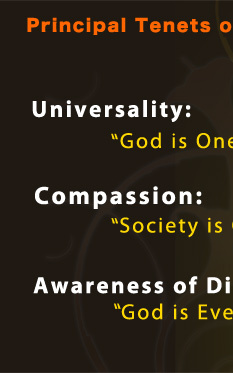 Swami also gives a lot of importance to society. That is because these days when everything is connected to everything, we cannot live in bubbles and act as if what happens around us is of no concern to us. To live in such foolish insularity inevitably causes a lot of damage to society as a whole, at which point even bubble-dwellers get affected. 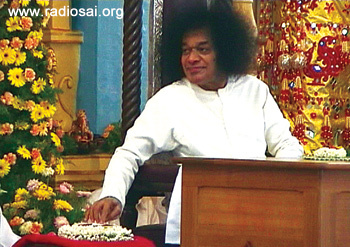 More than anything else, Swami wants all of us to see God in society not merely for serving it better but more so to realise that society and the Cosmos of which society is a tiny part, are the manifest aspects of God in Creation. Again and again Swami reminds us that unless we train to see God everywhere, in everything and all times, our lives would be out of sync with the Divine purpose and hence wasted, wholly in some cases and in substantial measure in others. God has come in human form mainly to teach us a lesson, and although most of the people who come here choose to pay little attention to the Message part, it is in fact our duty to absorb the Message, live it as best as we can, and pass it on to future generations. People don’t actually speak to me that way, but do send strong signals that convey essentially that thinking and feeling. I quite understand how they feel and why they do so. Sure, if you come from outside for a short visit, that exactly is the way it ought to be. But what happens when one goes back? Is it going to be Swami on the backburner, except during the weekly bhajan sessions or whatever? That is precisely where we ought to ponder deeply about why Swami has come and what is the core of the message He has been giving us all these years. For most of us, life is pretty rosy, and that is because we are on the right side of wealth, security and comfort. For hundreds of millions in this country, and billions outside, however, things are different because they all are on the other side. In India, we have always had the very rich and the extremely poor but until recently, America was different. When I was just out of college, going to the US, getting a doctorate and making it good thereafter in terms of career and job satisfaction, good income, comfortable life-style with all the standard package of goodies, was the dream of most young people. That was an era when American economy was so structured that one could work hard and easily go up to reach a reasonably decent standard of living. And if one was willing to study hard, get advanced degrees, etc., one could be more than comfortable. No wonder many who studied with me went West in large numbers. When the IT boom came, the number of dream-chasers grew from a trickle to a sizeable flood, since America was growing fast and needed people with scientific skills. Cut now to September 2008. That was when a series of economic pre-shocks starting with the tech bubble and leading on to the housing bubble culminated in what is called the big Wall Street crash. The dream ended almost overnight for hundreds of thousands of people, including many who had gone from here. There was a particularly tragic case of a bright young man who went from this country with the best academic credentials, did all the right things there, got his fine suburban home with many bedrooms and a big garage, two cars, plus all the other goodies he could dream of. When the crash came, his dream also collapsed since it had been built almost entirely on borrowed money. Unable to face his personal debt crisis, he took a gun and killed every single member of his family including his wife and children, before finally turning the gun on himself. Mind you, I am not saying all this to trash America or anything like that; far from it and let me make that absolutely clear. My point is entirely different; all I am saying is that living beyond one’s means to chase an illusion is highly dangerous. That has been tried out in many other countries as well, and today you can see many European countries also struggling with the debt burden. Even before unpleasant things start happening, there are some early warning signals, the most significant one being a sharp economic and wealth asymmetry. In this respect, both India and China are staring at a huge divide between the very rich and the poor. Tucked in between is the middle class still unaware of what happened elsewhere, but if the tipping point is reached, things could get pretty rough. To put it briefly, it is the rather rapid transition to a totally consumerist economy that has put country after country into all kinds of troubles, some more than others. Wherever we look, we find that when the economy grows very fast, the rich get richer and many of the middle class who are not able go up fast, go down instead joining the ranks of the not so well off. The more advanced the country, the worse this comedown is. 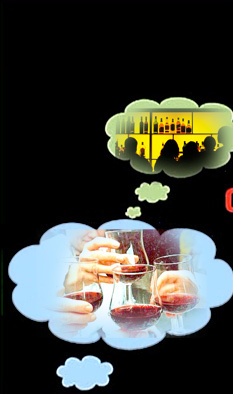 At this point you might say: “Listen, this is all socio-economics. What’s that got to do with spirituality?” My short answer is everything. 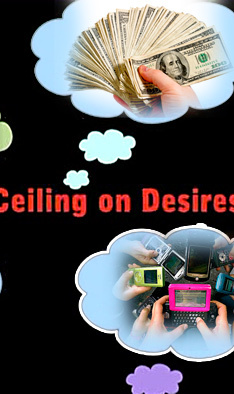 In fact, Swami’s strong admonition to us to put a ceiling on our desires is the essence of it all! 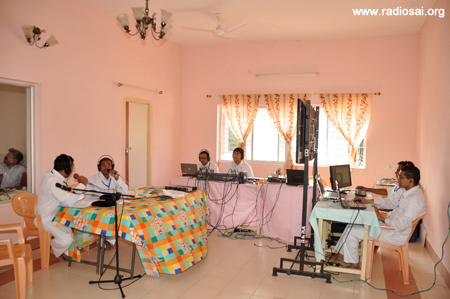 However, these days few ever refer to the topic of ceiling on one’s desires, which is why we took the initiative to present the month-long teleserial entitled the Message of the Lord. Incidentally, I should take this opportunity to thank all of you out there for responding so overwhelmingly to this experiment of ours. Thanks to deadlines, we produced the serial in somewhat of a great hurry and could not quite achieve the quality we wanted. However, it is OK as a beta version, that is to say, as trial; and be sure that it would be replaced later by a more carefully and professionally produced version for use by study circles, etc. Heartened by the enthusiastic response to this serial, we now intend to put the Message the centre of almost everything we do, especially because Swami’s teaching is the only meaningful answer to the numerous problems humanity now faces. Let me amplify on that a little bit. We all talk eloquently about Swami’s water projects, hospitals, etc. Few connect that to the emphatic declarations He made way back in 1947 in a letter written to His elder brother Seshama Raju. In that historic letter written when Swami was not yet 21, He vowed that He would do all He could to remove pain and suffering. All the projects that I just mentioned and many others that I did not are the direct outcome of that vow. And why did He take that vow? Because He always felt the pain of others – that is the key point. At this stage, I would like to make a brief reference to the powerful way in which Swami’s fundamental decision taken way back in the forties is making a Himalayan difference to tens of thousands of ordinary people, a difference about which we hear so little. To be more specific, I am now going to say a few words about a girl in her early twenties named Tapaswini Bhue, the daughter of a poor labourer named Arakshit Bhue, living in a small village in the state of Orissa on the east coast of India. Some of you might recall that about two years ago, Swami built 700 houses for flood victims in that state. 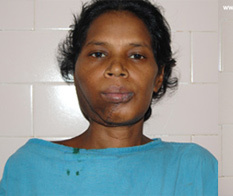 When she was a small child, Tapaswini developed a tumour that started as swelling on the right side of her jaw due to an infection of some sort in the gums. 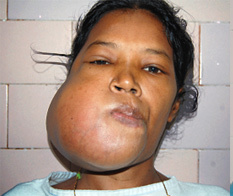 In course of time, the tumour became quite big, causing not only a lot of pain but also problems with both eating and speaking. 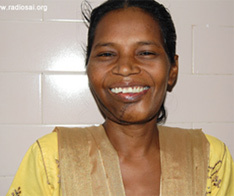 When Tapaswini became a big girl, she felt quite self-conscious about her appearance. Often she would cry for hours, lamenting why she had been condemned have such a distorted face. She also began to resent visitors coming to her hut because there was no place for her to hide. Meanwhile, the tumour became locally malignant and the pain became unbearable. Borrowing some money, her father took her to a clinic in Cuttack, Orissa’s biggest town. Many tests were done. When the poor father learnt that any treatment would cost a lot of money but with no assurance of any improvement, he returned a disappointed man. Something HAD to be done but no one had any clue as to what it should be and how to go about it. That was when Swami quietly entered the life of this distressed family. 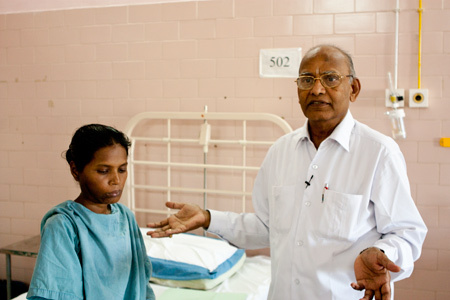 Someone in that village who had been treated in Bhagawan’s hospital in Puttaparthi, asked Arakshit to try his luck there. Borrowing money again, father and daughter travelled to Puttaparthi and showed up in Swami’s hospital sometime in early November, a few weeks before birthday. 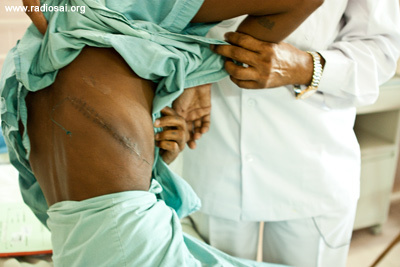 The doctor who examined her was Dr. Raghava Reddy, a man with rich experience in reconstructive surgery. 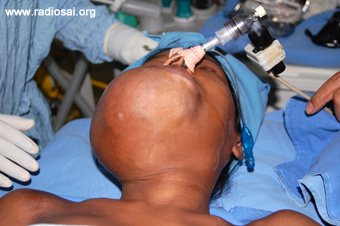 After extensive physical examination plus several x-ray shots, Dr. Reddy diagnosed Tapaswini’s problem as a case of ameloblastoma, a tumour originating from the dental region, possibly because of un-erupted tooth. 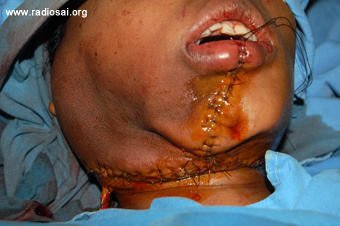 In simple terms, it was a case of local cancer involving the gum and neighbouring regions; fortunately, the malignancy was local and had not yet spread to other areas. A surgery was scheduled shortly before birthday. I remember Dr. Reddy telling me after evening darshan two days before the surgery, “Ask your boys to come and interview a patient from Orissa. This is an interesting case.” I promptly alerted our team and they got some nice interviews. 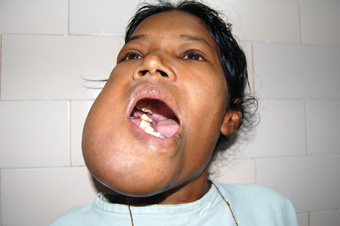 Compare the size of the tumour with that of the teeth; that is how big the abnormal growth was! 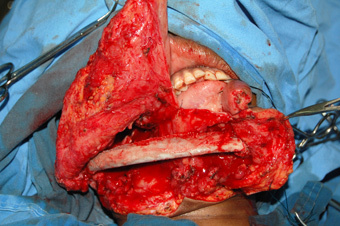 After the tumour was completely removed, a new jaw was created by placing a strip of bone from the ribcage, the 9th rib to be precise. A few days ago, Dr. Reddy walked into my office with a CD in his hand. He went to my PC, loaded the CD, clicked the file open and told me, “See this.” One by one, he showed me the pictures associated with this case, as I saw with my jaws wide open. It was all about the story of Tapaswini. 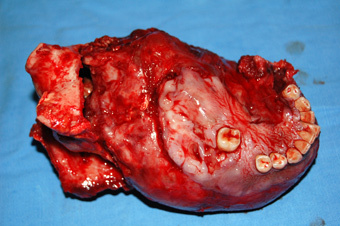 See how huge the tumour was to start with. 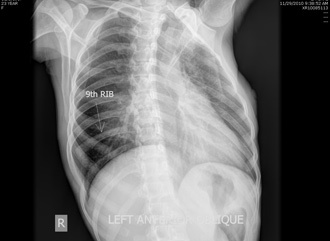 Take a look at the x-rays and the pictures of the surgery. Isn’t that frightening? 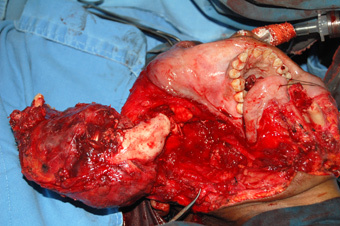 Notice the picture of the tumour after it had been removed; you can get an idea of its size from a tooth still stuck in there. 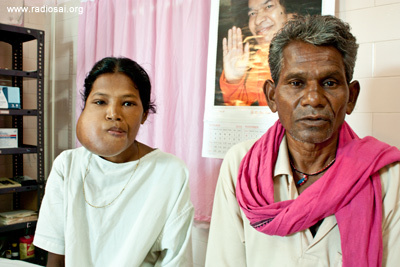 For reconstructing the jaw after tumour removal, Dr. Reddy needed a stiff support that would do the job of the jaw bone. Do you know what he did? He just took a piece of rib bone since its removal would not cause any serious harm. That meant cutting open a portion of the chest, sawing off a piece of bone and closing the chest. 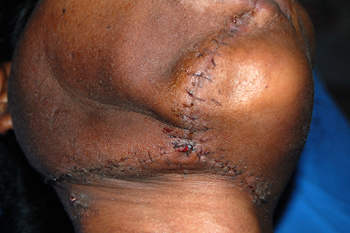 The cut rib piece was now inserted into the jaw and it is only after that everything was stitched up. Not surprisingly, the surgery took a long time. Can you guess how long? Ten hours! Dr. Raghava Reddy, Head of Reconstructive Surgery at Baba's Hospital did this marvellous marathan operation. On the left is Tapaswini diagnosis sheet. From years of sorrow to sheer delight! The happiness on Tapaswini's face on the day of her discharge is obvious! We shall be featuring a full video story of this moving case sometime later, meanwhile I want you to take note of a few facts. This is but one case, heart-warming though it is. This sort of thing happens all the time but few realise it, even us here who live so close to the hospital and see all these doctors practically every single day. These tens of thousands of miracles happen quietly and routinely all because Swami decided firmly and most emphatically to serve humanity. And when did He make that resolution? Way back in 1940, when He was but a fourteen year old. We all say we are devoted to Swami and all that. How ready are we to give even a few hours of our time for serious seva in a spirit of true compassion? We hardly think about the disabilities and the suffering people undergo, but we who are in the comfort zone would do well to spare a thought for people less fortunate than us and ask what we can do for them. Do you realise how much less of suffering there would be in the world if people everywhere were to ask this question and follow up in a suitable manner? At this point, I cannot help making a reference to a gentleman who is 90 plus, lives in the Ashram and actually works in the office here looking after many duties. The fact that he is doing this at his age is in itself a wonder. But what makes his service an act worthy of immense adoration is that he has a daughter who is herself quite old and disabled. There being no assistance at home, this gentleman has a tremendous problem looking after his disabled and retarded daughter. Does he complain about it? Absolutely not. Does he go around wondering why Swami has not cured his daughter and stuff like that? Never. Does he allow his difficulties to come in the way of his service? Not in the least. In fact, if you go to the office and see him working there, you would never in your dream realise what a cross he is bearing in his personal life. Dear reader, God comes down for many purposes. Some lessons he imparts directly while others even more powerful he teaches via his devotees. Life has its quota of problems for everyone. 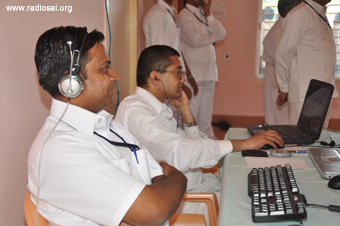 But some like Dr. Reddy and the other gentleman whom I referred to are super exemplars of true devotion. They serve with such intensity that we would not believe that they have difficulties of their own, problems so severe that they would make most of us forget service altogether. I agree that for some people, service necessarily got to be at home. That’s OK and God welcomes that as we know from the stories of Sravankumar and Pundalika, both of which Swami has narrated many times. However, those of us who do not have such severe problems and yet find excuses for not finding time to serve the less fortunate should take a lesson or two from unsung heroes of society of whom there are plenty. They are the ones who are truly dear to God. You do not have to take my word for it; go and check in the 12th Chapter of the Gita to find out what the Lord Himself says! 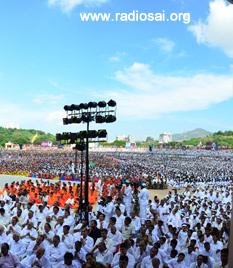 I think I have said enough and once again let me thank all of you for extending such sustained support to Radio Sai ever since we got going on Swami’s Birthday in 2001. If we are where we now are, it is a) due to Swami’s Grace of course and b) due to the generous support you have constantly extended, most kindly putting up with all our shortcomings, which, we here know only too well are quite a few. Thank you once again and God bless, Jai Sai Ram.